When it comes to making beet converts of nonbelievers, I have a pretty stellar track record. This recipe in particular is the one that does it. I receive rave reviews of this salad wherever I bring it. 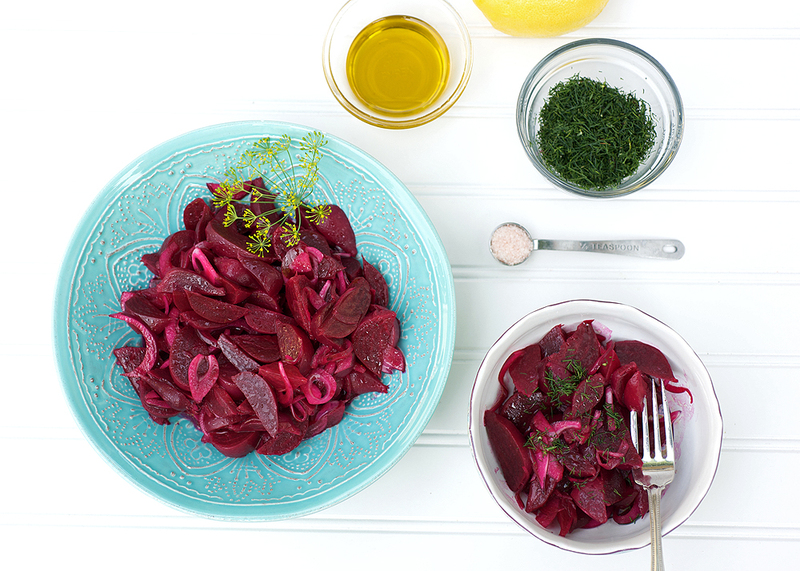 It’s so incredible simple, yet beets never tasted so good as when they’re prepared this was. Truly. There are a couple secrets. One, the lemon juice – don’t skimp on it. And two, let in sit in the fridge at least several hours, overnight is better, before serving. Smaller beets take less time to cook and taste less ‘earthy’. Handling beets will temporarily stain your fingers pink – this is not to be feared. It’s cool to have pink fingers, and after a few hand washings, the color fades. Golden beets don’t stain fingers, or anything else for that matter, and have a less earthy taste than red beets. Beets are super easy to peel while they’re still warm after cooking, not so much when they’re room temperature or cold. The greens attached to beets are edible. They’re delicious and taste like spinach. They can be sauteed in garlic and olive oil with a squeeze of fresh lemon and a sprinkle of salt. 1. Cut green tops and ‘tails’ off of beets. Scrub beets with a vegetable brush. 2. Cook the beets: Place beets in a saucepan with enough water to cover them by two inches and season generously with salt. Cover and bring to a boil. After they come to a boil, lower heat to keep them at a high simmer and cook until fork tender, about 30-40 minutes. Drain them in a colander set in the sink and allow to cool. When they're cool enough to handle, remove their skins, by holding one beet at a time in both hands and rubbing your thumbs over the skin. The skins will easily slip off. 3. While the beets are cooking, slice onions into very thin crescents. 4. Whisk olive oil, lemon juice, dill and sea salt. 5. Cut beets into bite-sized wedges. 6. Combine beets with onions. 7. Combine together and marinate for 25-30 minutes, longer is better. 8. Taste and adjust seasonings to keep your palate happy. I almost always add more lemon and a bit more salt after the beets marinate.